Honolua Bay is located on the northwestern coast of Maui, about 10 miles north of Lahaina along Honoapi‘ilani Highway (Hwy 30). The bay is the only one in the area visible from the highway. Parking is available only alongside the highway. 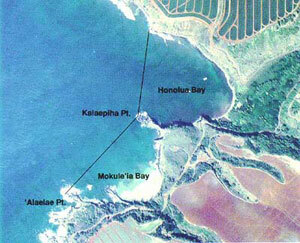 Mokulē‘ia Bay is southwest of, and adjacent to, Honolua. The beach at Mokulē‘ia, known locally as Slaughterhouse (because there once was a slaughterhouse on the cliffs above) is accessible along a stairway down the cliffs. Again, parking is found only along the highway. The MLCD extends from the highwater mark seaward to a line from ‘Alaelae Point to Kalaepiha Point, then to the point at the northwestern corner of Honolua Bay. Honolua Stream carries varying amounts of silt into Honolua Bay. As a result, inshore waters of the bay near the boat ramp area are usually very murky. The bottom here consists of small boulders and silt. Visibility improves as you swim farther out, or to the sides. The middle of the bay is a featureless sand channel, sloping gradually to a depth of about 60 feet at the bay’s mouth. On either side of the bay are dense coral growths, in waters about 10 to 40 feet deep. Coral is more abundant and diverse along the northeastern shoreline. Small caves and archways are found near the point on the bay’s left side. The bottom at Mokulē‘ia Bay is mostly sand. At the right point are large submerged boulders, and fingers of lava occur along the left point. Both points offer good coral growth. Depths range from about ten to fifty feet. If the water is calm enough, you can snorkel from one bay to the other. Waters should be avoided during winter months, when high surf is common. To possess aboard any boat or watercraft any legal fishing gear and fish or other aquatic life taken outside of the District. With a permit, to bag and remove akule netted outside of the District, provided the net is moved only over the sandy bottom areas of the District, and to engage in activities otherwise prohibited by law for scientific, propagation, or other purposes.